This week I would like to introduce you all to an interesting cider made by the team at The Australian Brewery in Sydney's Rouse Hill. The guys have said they were inspired by England, the 'spiritual home of great cider' when making this cider. 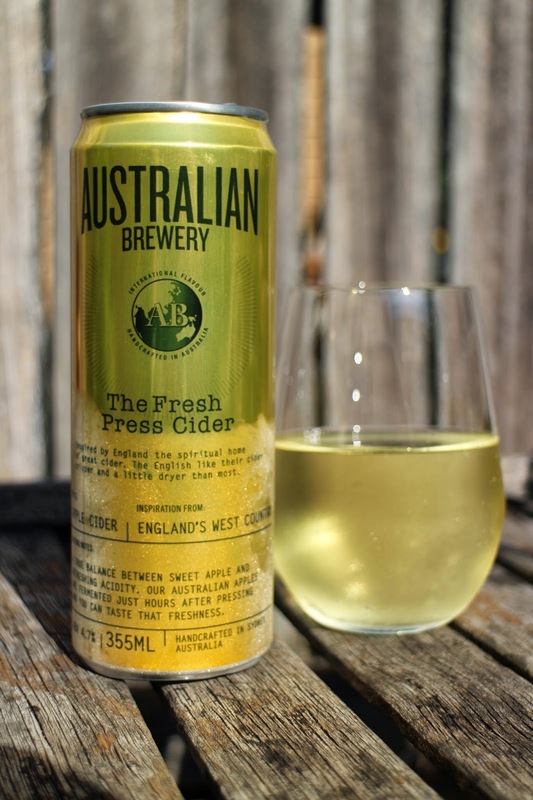 The first thing you may notice about this one is that it comes in a can, a nice point of difference given that more than 90% of ciders available for purchase in Australia are bottled. Firstly, a juicer in Picton, Sydney presses their apples and juice is transported to the brewery within 2 hours where it is placed in a fermentation tank that same day. Next, a white wine yeast is used to ferment the juice and the process is stopped when only a small amount of residual sugar remains. The cider is then chilled and filtered rather than pasteurised to maintain freshness. Pete and I quite enjoyed this cider, it has more complexity than commercial ciders, and it lends itself to more of a dry country-style of cider. A pale straw colour with light carbonation, it has a fair amount of balanced acidity and just the right amount of sweetness. It has a very clean, crisp feel on the palate and is nice and easy to drink. This one will pair well with fresh grilled seafood and salad with fig and goats curd or a delicious fruit platter. At 4.7% alcohol, a 355ml can will provide you with 1.4 standard drinks. Sounds great! I wonder if can vs bottle makes a difference in taste, as it happens with other drinks. Perfect for a hot day! Love the pic too!